SAN FRANCISCO--(BUSINESS WIRE)--IPG Media Lab, the creative technology arm of IPG Mediabrands, in partnership with Immersion Corp. (NASDAQ: IMMR) today announced the results of a scientific media trial examining the impact of touch-enabled advertising created with haptic technology. 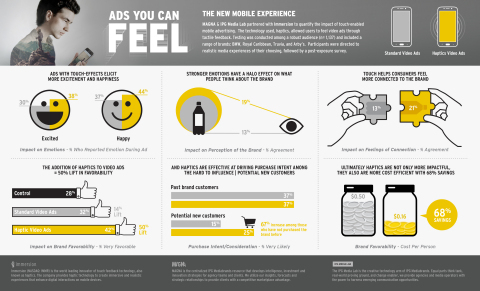 The resulting report, Ads You Can Feel: The New Mobile Experience, shares best practices, findings and insights on leveraging users’ senses, including sight, sound, motion, and now, touch, to create visceral mobile experiences. Over the course of the study, touch-enabled ads from a wide array of industry sectors, including automotive, hospitality and food & beverage were used to test consumers’ reaction to the experience. The study of Immersion’s haptic technology, which enables users to feel touch effects on digital devices, found that adding touch to ads increases engagement and users’ sense of connection with a brand. Among the most notable findings is that haptic technology elicits a strong emotional response, particularly increasing levels of happiness and excitement. In the study, a standard video ad achieved happiness and excitement levels of 37% and 30%, respectively. Haptic video advertisements, or TouchSense® Ads, saw upticks in both categories at 44% and 38%. Moreover, this outcome created a halo effect on the brand, generating a +6% increase in perceptions that the brand itself is exciting because haptics were added. In an ever-fragmented consumer landscape, brands are still determining how to best leverage technology and enable user interactivity. This served as the key element behind the launch of the media trial, which used seven distinctive ad types across two variant modes (skippable and non-skippable) to measure engagement and connectivity levels of haptic technology. Leading brands from a range of industry verticals, such as BMW, Royal Caribbean, Arby’s, and Truvia participated in this innovative media trial. The IPG Media Lab is the creative technology arm of IPG Mediabrands. Equal parts think tank, real-world proving ground, and change enabler, we provide agencies and media operators with the power to harness emerging communication opportunities by offering expertise, resources and consulting services tailored to drive quantifiable outcomes, learnings and strategies. The IPG Media Lab is part of IPG Mediabrands, the media innovation and investment arm of IPG. For more information, please visit www.ipglab.com or follow @ipglab. All statements, other than the statements of historical fact, are statements that may be deemed forward-looking statements, including, but not limited to, statements regarding the benefits and capabilities of Immersion's haptic technology or TouchSense Ads and statements that with Immersion's haptic technology or TouchSense Ads, mobile ads and brand experiences perform better on key metrics such as brand sentiment, brand favorability, and purchase intent. Immersion's actual results might differ materially from those stated or implied by such forward-looking statements due to risks and uncertainties associated with Immersion's business, which include, but are not limited to, the risk that competing technologies may reduce demand for Immersion's haptic technology; unanticipated difficulties and challenges encountered in product development efforts by Immersion and its licensees; unanticipated difficulties and challenges encountered in implementation efforts by Immersion's licensees; adverse outcomes in any future intellectual property-related litigation and the costs related thereto; the effects of the current macroeconomic climate; and delay in or failure to achieve commercial demand for Immersion's products or third-party products incorporating Immersion's technologies. Many of these risks and uncertainties are beyond the control of Immersion. For a more detailed discussion of these factors, and other factors that could cause actual results to vary materially, interested parties should review the risk factors listed in Immersion's most current Form 10-K and Form 10-Q, both of which are on file with the U.S. Securities and Exchange Commission. The forward-looking statements in this press release reflect Immersion's beliefs and predictions as of the date of this release. Immersion disclaims any obligation to update these forward-looking statements as a result of financial, business, or any other developments occurring after the date of this release. The use of the words "partner" or “partnership” in this press release does not mean a legal partner or partnership. 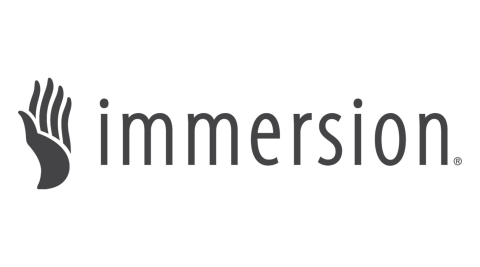 TouchSense, Immersion, and the Immersion logo are trademarks of Immersion Corporation in the United States and other countries. All other trademarks are the property of their respective owners.